Genesis is the most popular WordPress Framework. We are huge fans, in fact this site right here is powered by a Genesis child theme. Here is our handpicked collection of 100% free to download, modern looking and fit for 2018 child themes for Genesis. The Genesis Framework is the most popular WordPress theme framework to run your website or blog on. The framework itself is simply a parent WordPress theme and what makes it rock’n’roll is the child theme. We are huge fans, in fact this site is powered by Genesis and we’re using a child-theme called Altitude Pro. However it’s a premium theme, not a free theme. Here below, we have collected the best and free Genesis Framework child themes that are built on the rock-solid Genesis Framework from StudioPress. All themes listed are modern looking, responsive, optimized for search engines, fast loading – and best of all – the themes are all 100% free to download. However. To use any of the free Genesis child themes listed here below, you need to buy the Genesis Framework which is currently priced at $59.95 (one-time cost). One of the best things about buying the Genesis Framework is that it comes with unlimited updates, unlimited support, access to detailed tutorials, can be used on unlimited websites, and includes a starter child theme. But before we dive into the list of free child themes for the Genesis Framework. Let’s find out a bit more what the Genesis Framework is, and what a child theme is. As we’ve already mentioned Genesis is a WordPress Framework by StudioPress and it’s one of the most popular WordPress Frameworks out there. And with good reason. Because Genesis is currently used on more than 280K websites and takes up 13% of the WordPress theme market share. Genesis Framework is a powerful, secure, SEO friendly and mobile responsive Framework that is designed to always be used with a child theme – be it one of StudioPress premium child themes or a third-party premium or free child theme. Genesis 2.0 (current version is 2.4.2) also has a very active developer community and many WordPress/Genesis developers have their own blogs where they share helpful tips and tutorials. One of the greatest things about Genesis is that it comes with unlimited updates, unlimited support, access to detailed tutorials, unlimited websites, and includes a starter child theme and of course the Framework itself. So how much does the Genesis Framework cost? The one-time cost is just $59.95. Premium child themes range between $79.95 and $99.95. Why use the Genesis Framework? Imagine a sports car. Think of WordPress as the engine, the Genesis Framework as the body and frame, and the Genesis child theme as the paint job. The Genesis Framework is the parent WordPress theme and the Genesis child theme is a WordPress theme which built on top of the framework and the child theme inherits the functionality from the parent theme. The main benefits of using a child theme is that you can easily, and safely, update the framework (might be a security patch, bug fix improved functionality). With a “regular” non-framework WordPress theme there is no easy way of updating it without losing all the custom styling and changes that you have made to it. That’s not the case with a child theme. When a new upgraded version of the Genesis Framework comes out, you can safely update it because all your customizations are saved in the child theme. Because a child theme automatically inherits the parent theme’s features, styles, and templates. This way you don’t actually need to touch the core files in the parent theme (nor would you need to). Clever right? Now let’s get into the freebie themes. This here is our collection of free child themes, for Genesis Framework, that are elegant, responsive and modern looking (i.e. “fit” for 2018 and beyond). Please note that all of the below child themes require the Genesis Framework (because the themes won’t work without it). To use any of the child themes listed here below, you need to buy the Genesis Framework which is currently priced at $59.95 (one-time cost). 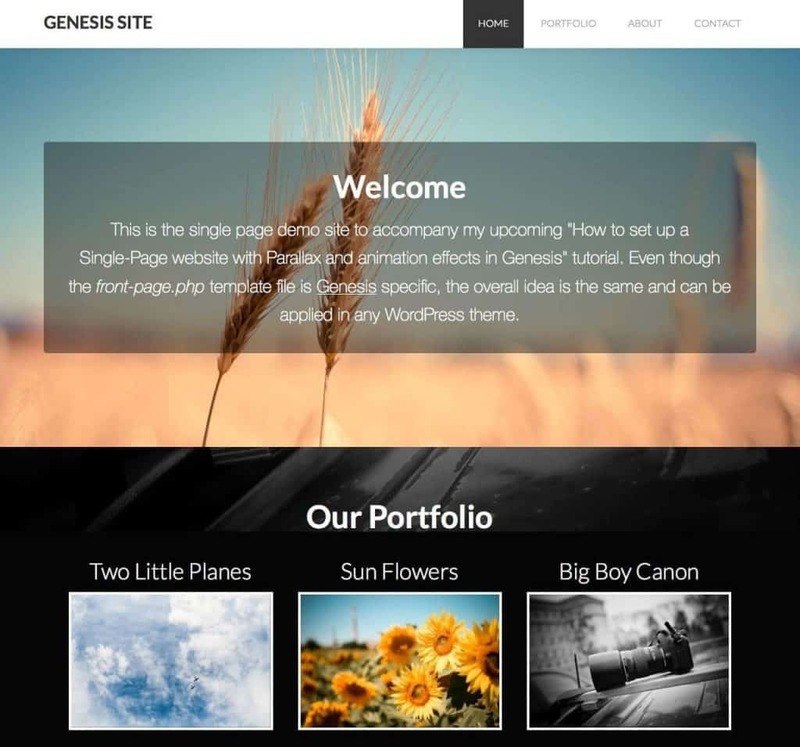 The Genesis sample theme is a starter theme that is included for free when you buy the Genesis Framework. The theme features 6 page layouts, custom background, custom header, custom menus, footer widgets, threaded comments and more. 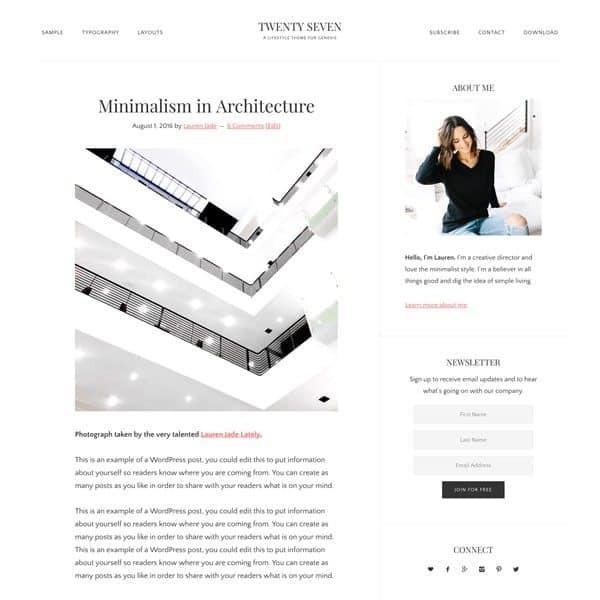 Twenty Seven Pro is a free minimalist child theme that is ideal for lifestyle and food bloggers. The theme is made by Brian Gardner (founder of Genesis Framework & StudioPress). This stunning minimalistic theme comes with mobile responsive design, custom logo uploader, color options via the theme’s customizer, three site layout options, sticky message header widget area, before header & footer widget area, plus lots more. Mobile First is another free child theme from Brian Gardner that embraces the mobile-first approach. This stunning minimalistic theme comes with mobile responsive design, 3 page layouts, custom logo uploader, 3 widget areas, sticky message header widget area, custom background option, plus lots more. 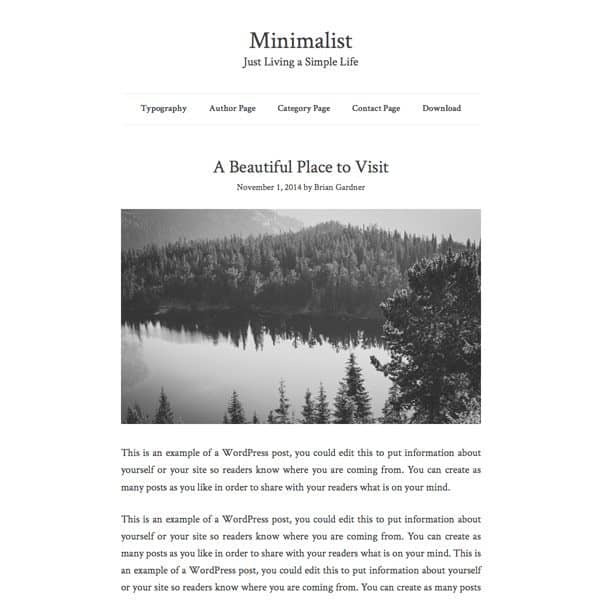 Minimalist is yet another free minimalist child theme from Brian Gardner (founder of Genesis Framework & StudioPress). 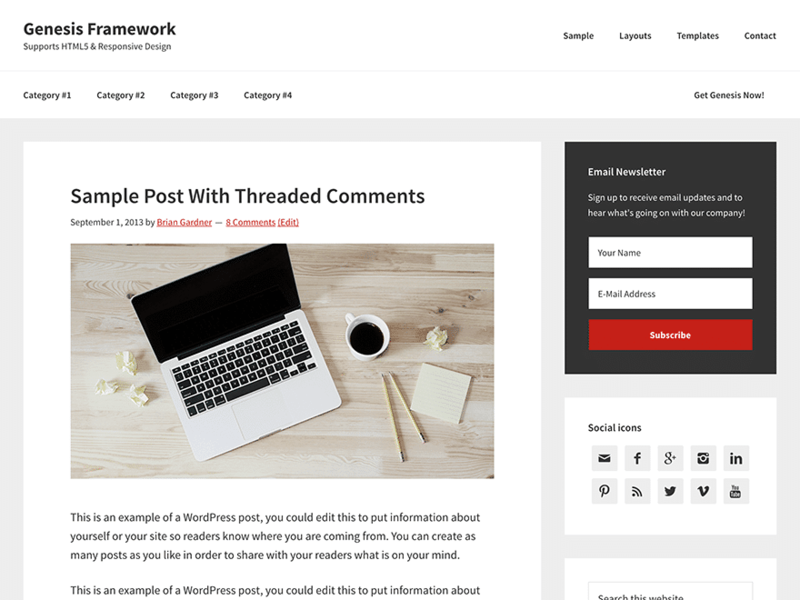 This theme supports single layout, custom header, background image, header image, primary and secondary menu, threaded comments – and more. This theme does not have any widgets. 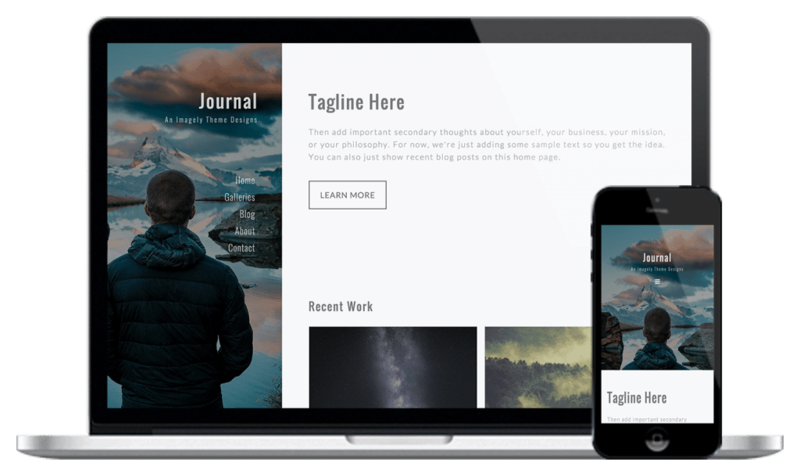 Journal is a free Genesis child theme for WordPress from Rafal Tomal (lead designer at Rainmaker Digital). 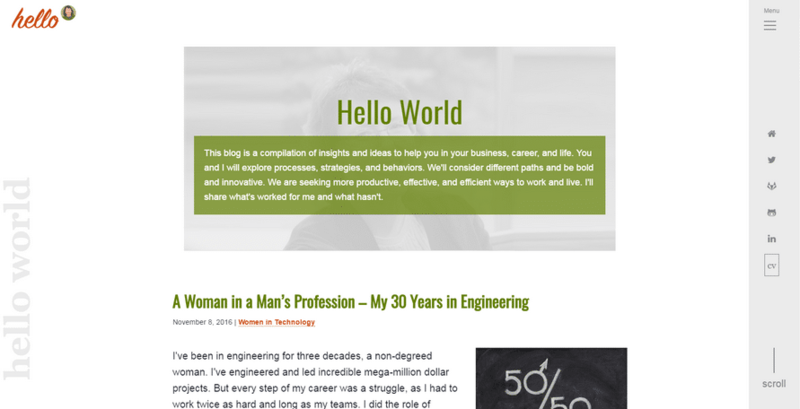 The theme uses a very lightweight design and intended to be used primarily for simple personal blog sites. The home page has one content area above the recent posts, the theme doesn’t have visible sidebars, but the primary sidebar is hidden behind the screen which can be accessed by clicking the Menu button. 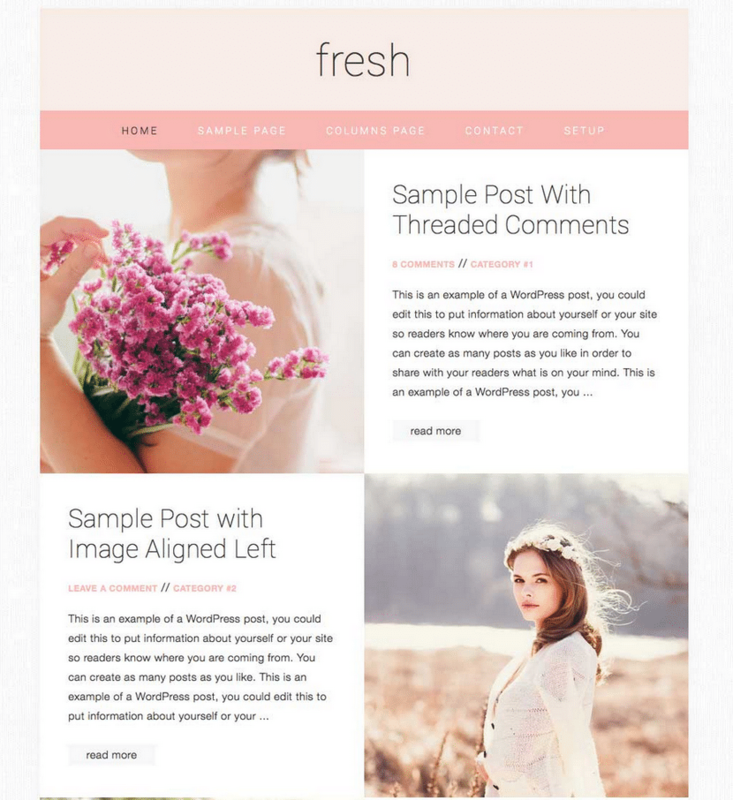 Fresh is a free feminine Genesis child theme for WordPress made by Restored 316. The theme’s design is modern, fresh and light and the theme is perfect for blogs. 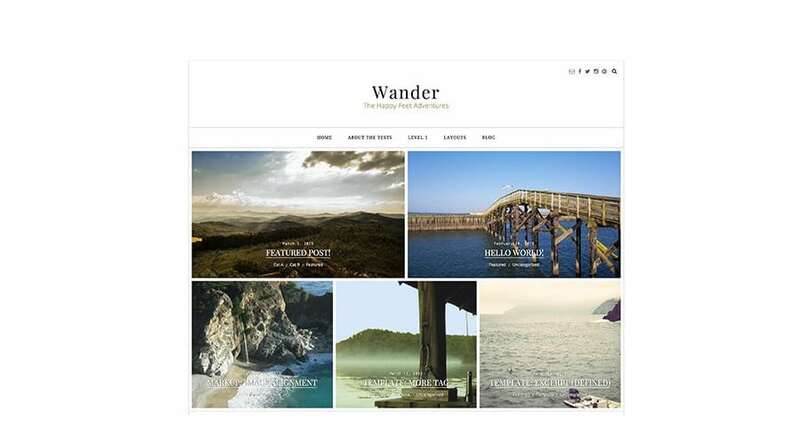 Wander is a free Genesis Framework blog child theme from PHPbits. This premium theme is SEO friendly, mobile optimized and responsive with any devices, and the beautiful asymmetric grid layout is ideal for a blog or news/magazine site. Starter Theme (v2) is a powerful boilerplate theme for developing Genesis Framework child themes. 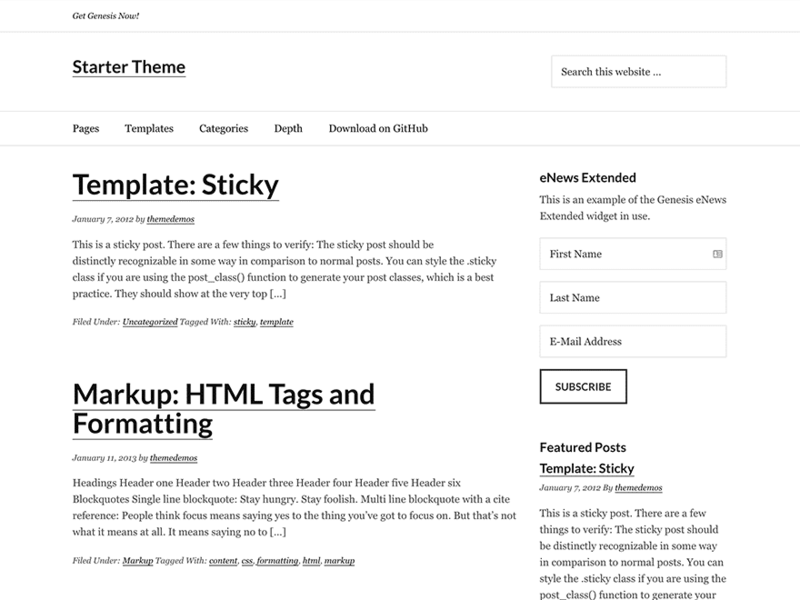 You can generate a new theme every time you need one, because it’s ready for development from the start using SCSS, Gulp tools, and naming pre-configured. 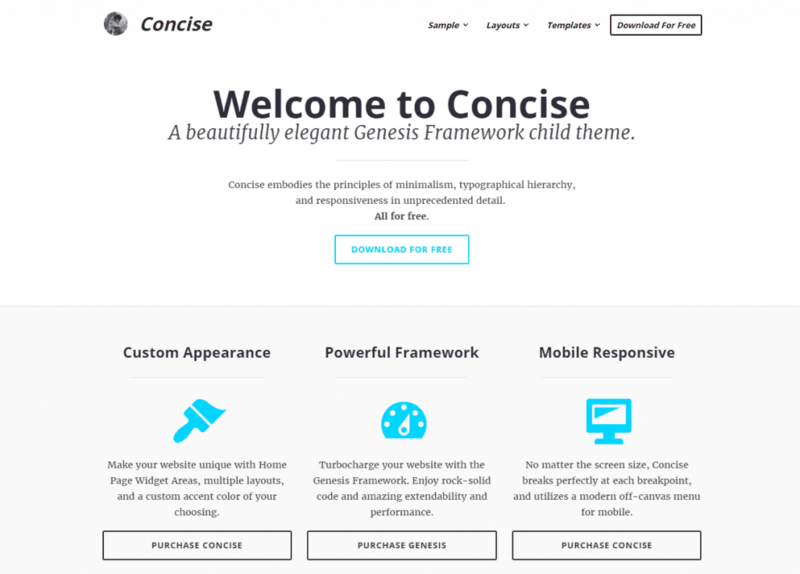 Concise is a free Genesis child theme from Calvin Koepke (frontend designer at Rainmaker Digital). 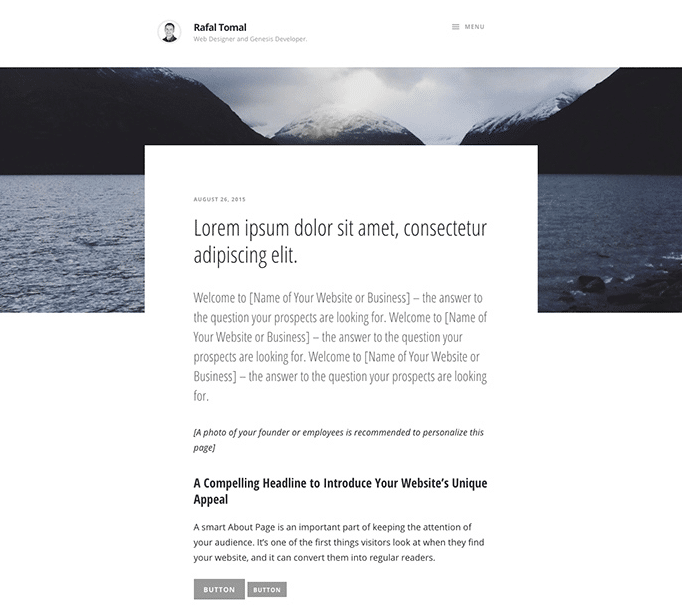 The theme emphasizes modern and tech-focused content. It features sans-serif style typography and elegant animations. Letter is another free Genesis child theme from Calvin Koepke. This theme takes you back to the roots of what writing is all about: communication. It features a narrow column design and serif-style typography. Minny+ is yet another free child theme for the Genesis Framework from Calvin Koepke. This theme comes with 3 page layouts and templates, and the theme highlights featured images and offers a sophisticated serif-style typography set. Journal is free photo blogging child theme for Genesis from Imagely. 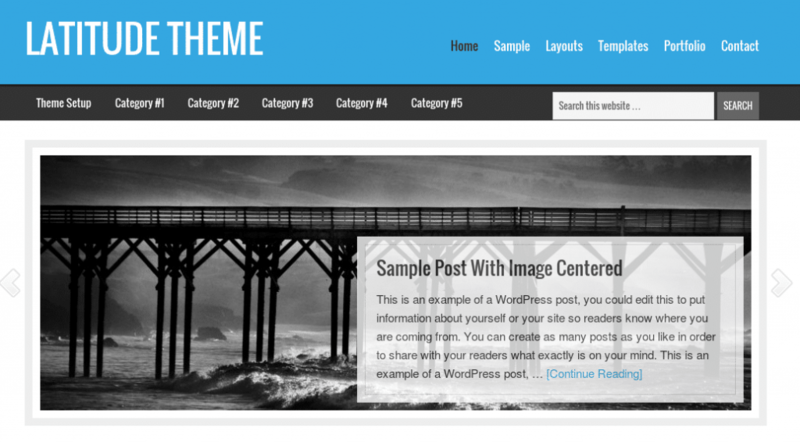 This theme comes a static left menu and background photo, multiple blog, page, portfolio and post templates. Journal also comes with detailed documentation on how to setup and customize the theme. Aiko is a free Genesis child theme from Andrei Chira. The theme’s design is black & white, minimalist and with emphasis on beautiful photography. 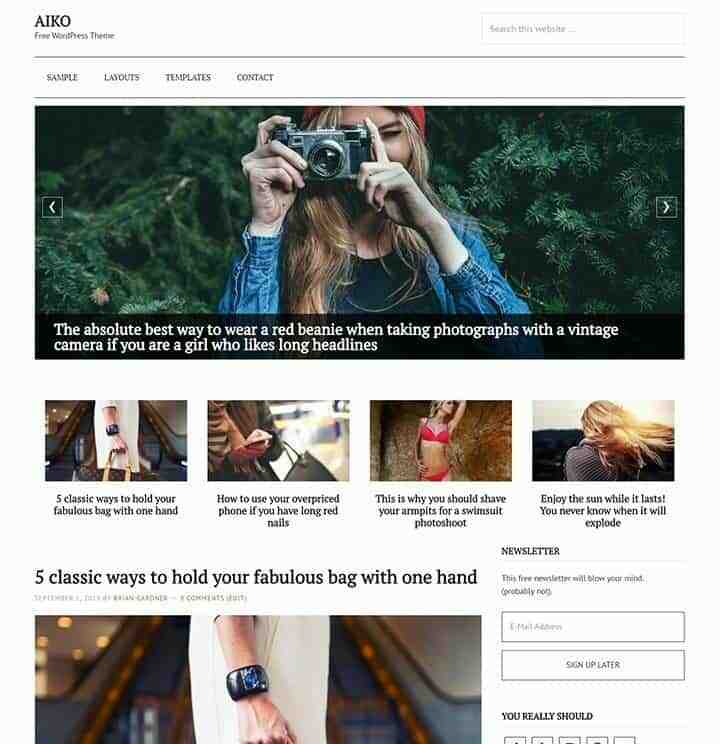 Aiko is perfect for food, fashion and magazine blogs and it comes with an after header widget area and 4 widget areas on 4 columns. Kimi is a free business child theme for Genesis that is also created by Andrei Chira. This theme is perfect as a business theme and the homepage is set to full-width-template and columns are made with the Genesis Columns Advanced plugin. 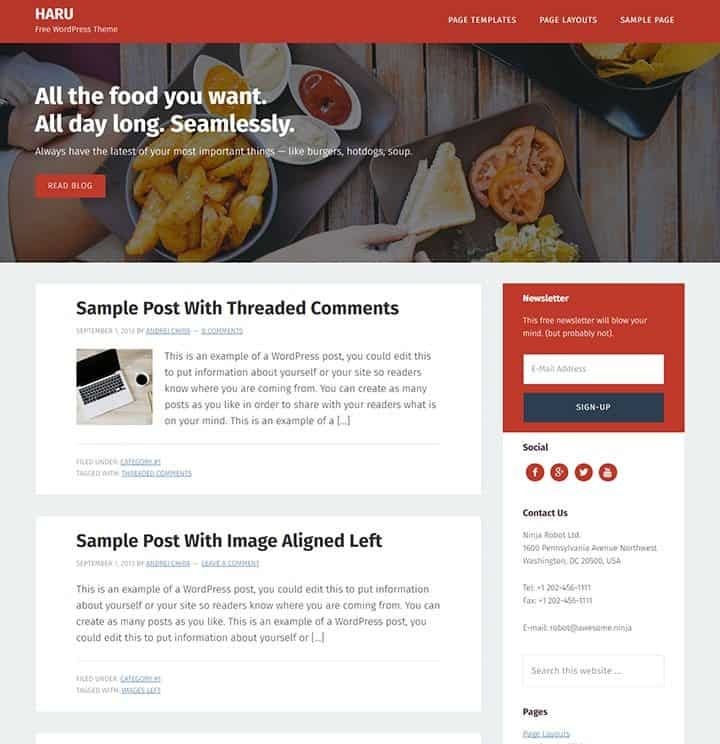 Haru is a free food blogging child theme made by Andrei Chira. The theme uses a red and dark blue color scheme and has an after header widget area with a full width hero image background. Fremedy is a free Genesis child theme that runs on either Genesis or Thesis 2. The theme includes a homepage slider, a landing page template and portfolio pages, and loads more. 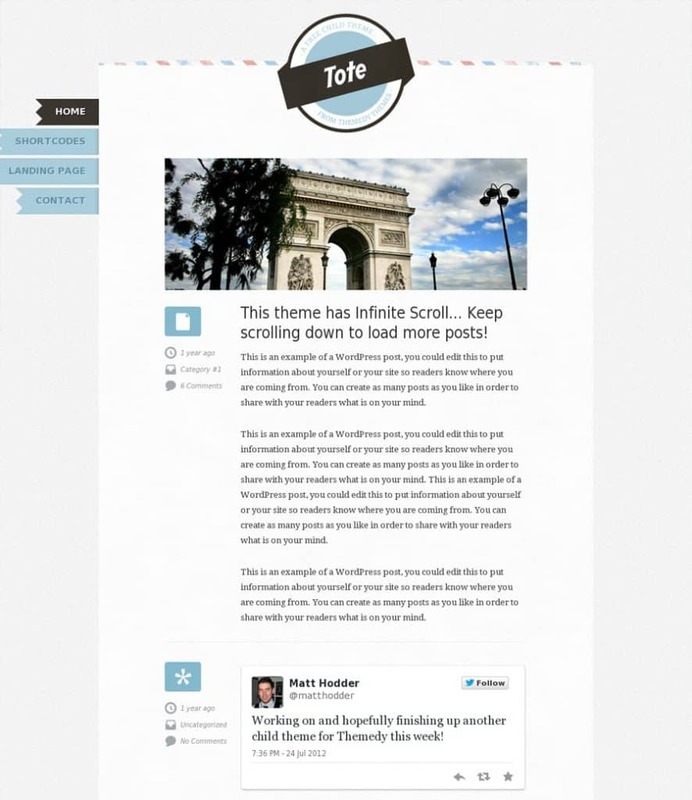 Tote is a free Genesis child theme that is inspired by Tumblr and their infinite scrolling themes. 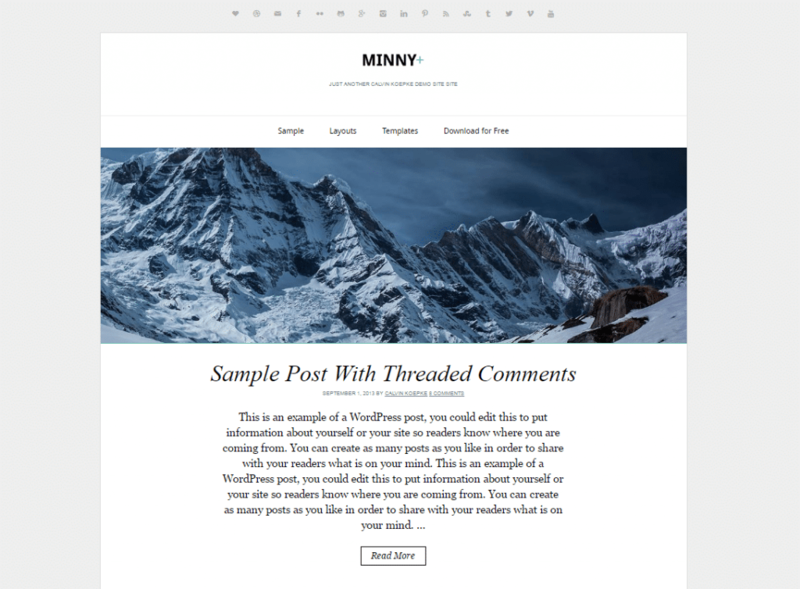 The theme is perfect for showcasing your blog and it comes with a range of styles, features, and clever backend options. 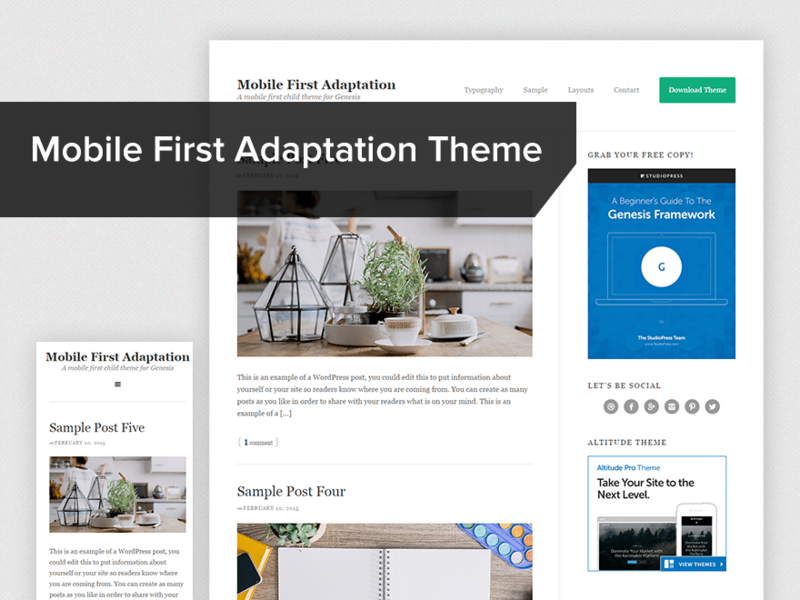 Mobile First Adaptation theme wordpress is created by Art of Genesis. 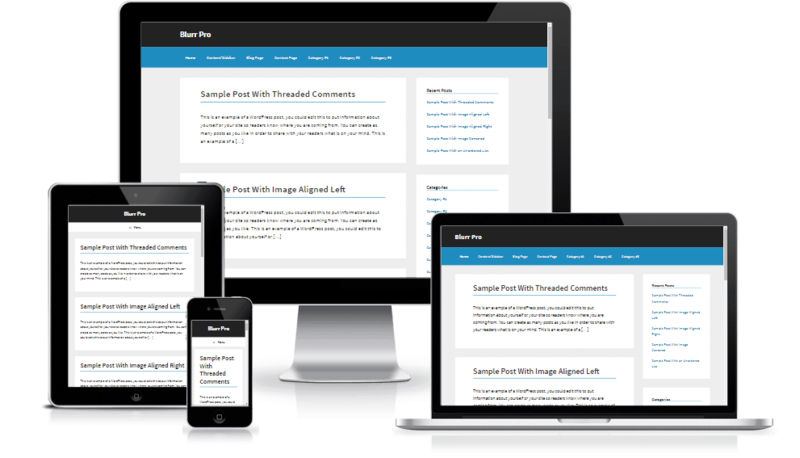 The theme is a mobile responsive and HTML5 theme built for the Genesis Framework that is free to use. 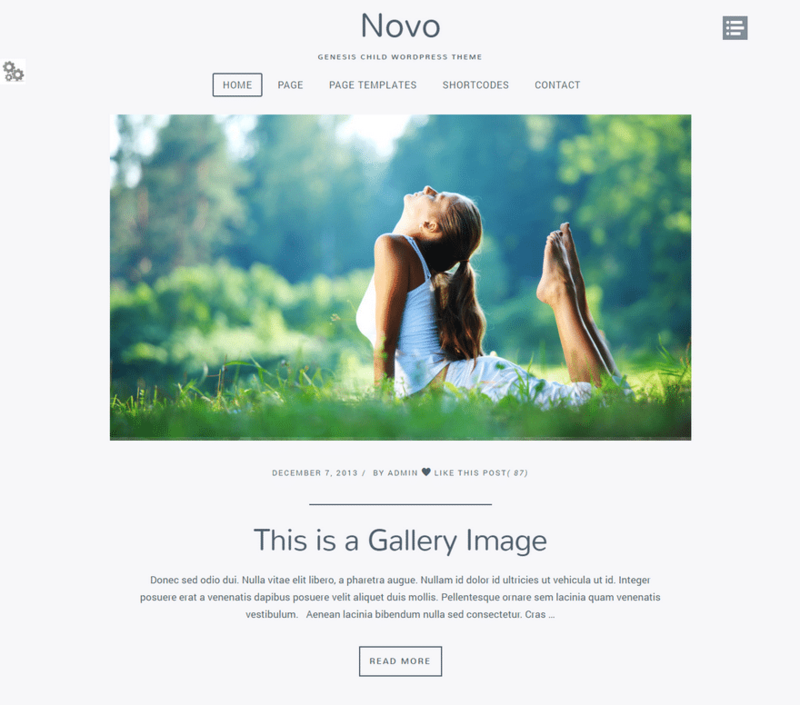 Novo is a free Genesis child theme that combines a modern flat design with a minimalistic style. The theme is mobile ready, SEO optimized and is perfectly designed to be a portfolio site or personal blog. 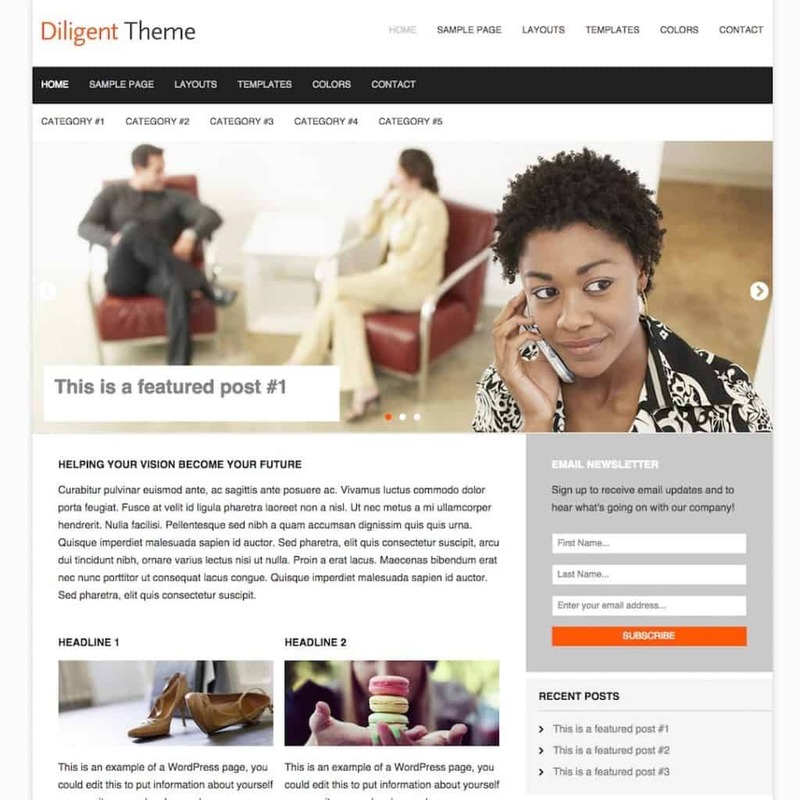 Diligent is a clean and simple Genesis child theme designed with consultants, coaches and entrepreneurs in mind. The theme includes 6 color styles, 4 page layouts, featured image auto-display, custom theme options, custom background, custom menus and loads more. Equilibre is clean and minimalist free Genesis child theme that is perfectly suited for small businesses and freelancers that like to keep the site simple. The theme includes Html5 markup, custom theme options, custom background, custom menus, 4 Page layouts, built-in Font Awesome and lots more. Hello Minimal is a minimalistic Genesis powered child theme from Tonya Mork. 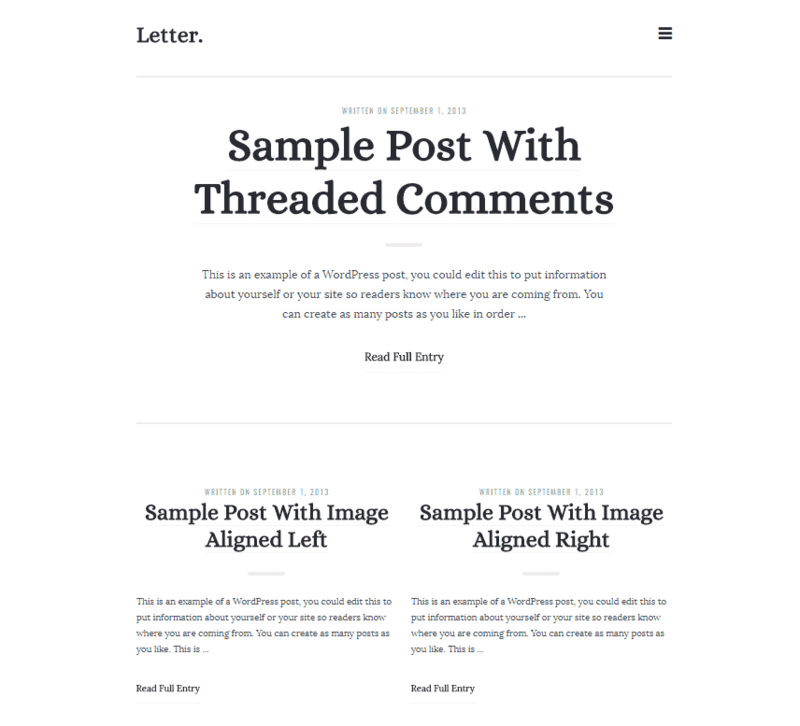 The theme is clean, modular and minimal – it’s the perfect theme for personal blogs. One Pager is a free one-page parallax website child theme for Genesis. Created by Sridhar Katakam this theme is primarily meant for single page websites that have several horizontal sections with the nav menu items scrolling smoothly to their corresponding sections. Nominal is a free minimal child theme for the Genesis Framework from Eli Overbey. 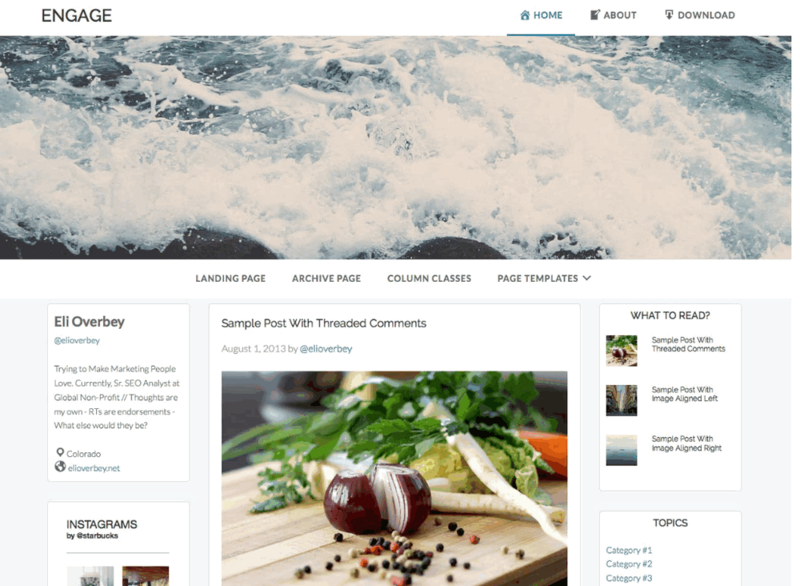 The theme takes a “less is more” approach and comes with custom header and featured images. 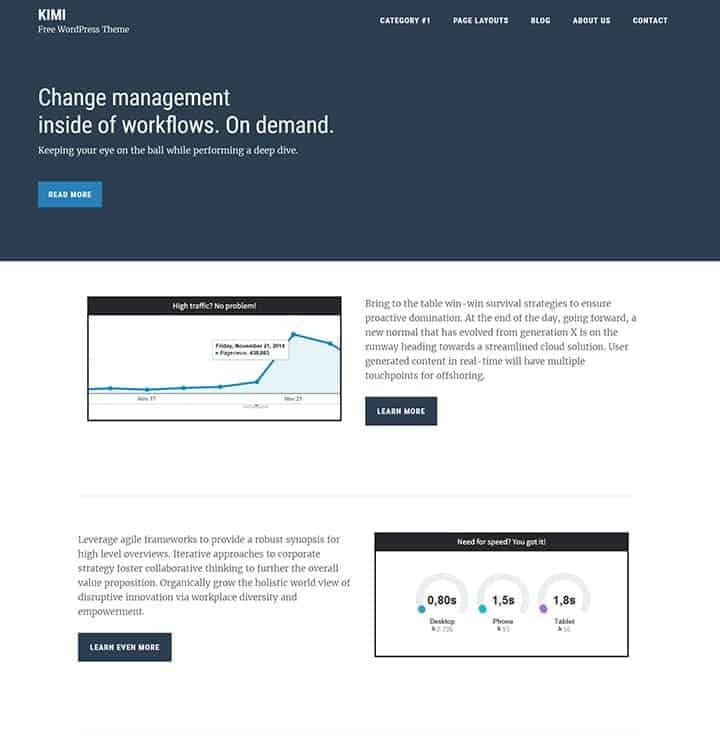 It also comes with a footer widget, HTML5 markup, mobile responsive design, dedicated landing page + loads more. Nominal is a free social child theme for the Genesis Framework, also from Eli Overbey. The theme that features a social like interface and features 3 layouts, widget areas, and mobile responsive. The theme divides your content into parts with a hero image and featured image on every post. It also features a custom header, HTML5 markup, and custom theme options. Latitude is a free news/magazine child theme for the Genesis Framework, from Aaron Hartland. The theme is a 2 or 3 column widget ready theme and comes with a slider, portfolio page template, 6 page layouts, custom background, custom header, custom menus, footer widgets, threaded comments, and lots more. Blurr Pro is a minimal custom Genesis child theme from Magnus7 that is free to download. 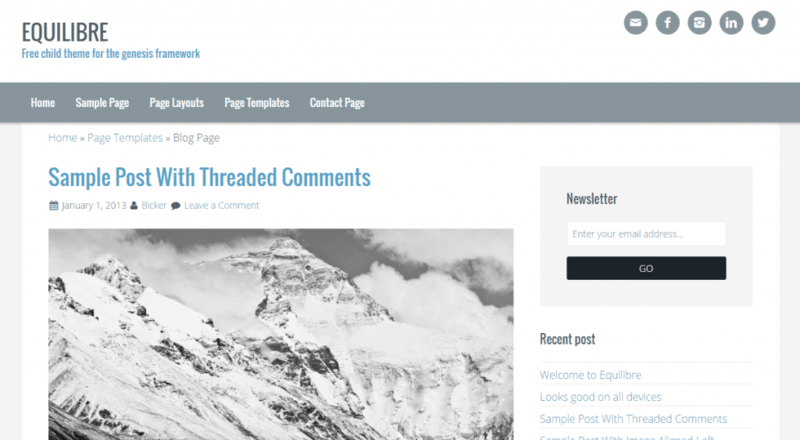 Breakpoint is a free Genesis child theme for WordPress made by Brad Potter. 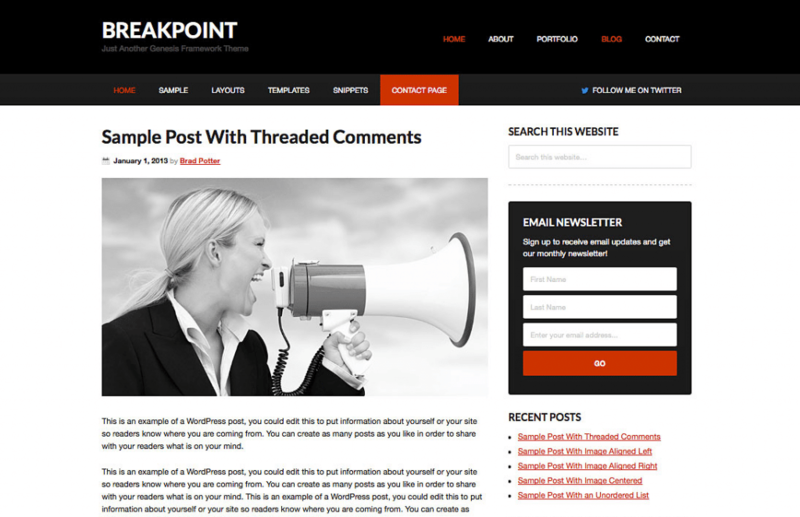 Breakpoint is a bold, statement-making (and looking) theme that is perfect for blogs. It features many layouts and page setups and has lots of other functionality to suit your needs. 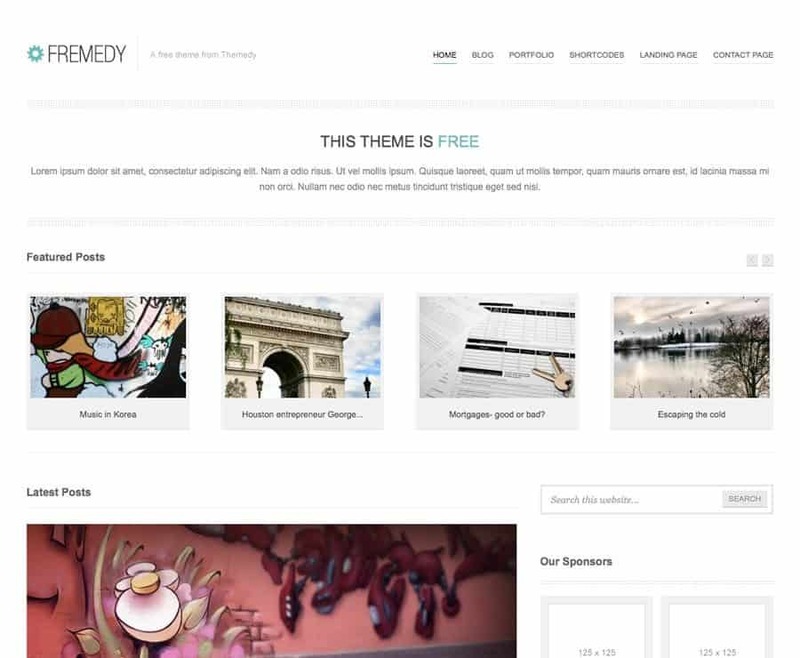 This theme is flexible and could be used for many different types of websites. It is easy to navigate and readability is excellent. 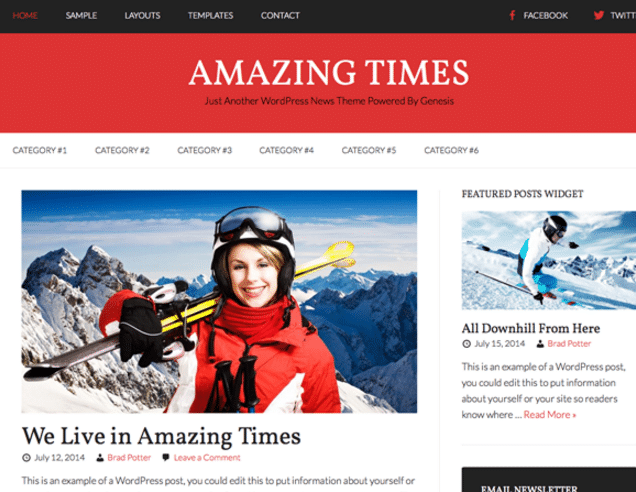 Amazing Times is a free Genesis child theme for WordPress that is also made by Brad Potter. The theme comes with a unique primary sidebar for the Homepage, after entry widget area, sub footer widget area, footer widget area, colorizer (changes the color scheme) in customizer, tertiary navigation menu, responsive mobile menus, Google fonts plus lots more. Twenty of Time is a free WordPress Genesis child theme from Friso van Dijk. The theme is utilizing a simple, yet stylish blog layout and you can pick different colours and match them as you feel like. The theme also allows featured images, as well as custom widget areas and a number of nice looking page templates and layouts. 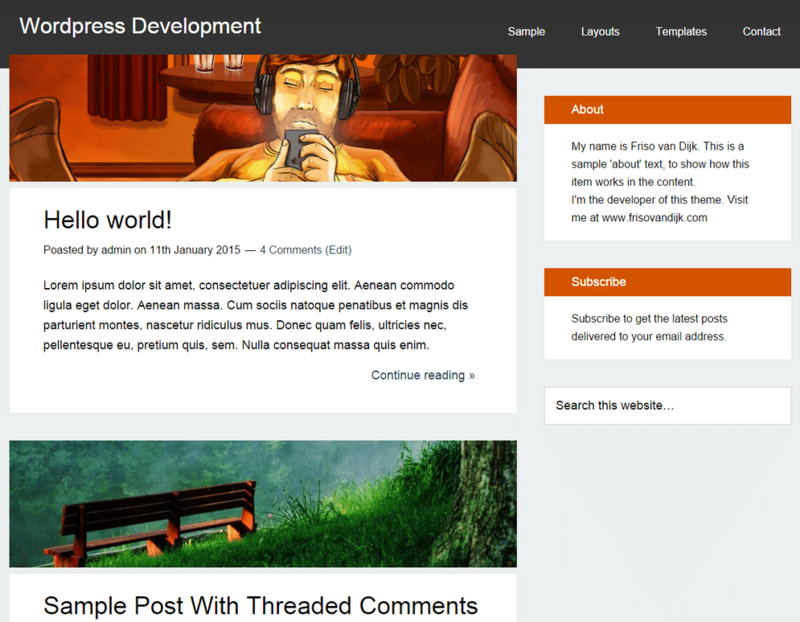 Center is a free blog child theme for the Genesis Framework. The theme comes with two color schemes, light and dark. Customizable footer text. Two footer widget areas, one header widget area, and one widget area below primary navigation. So, now you know a bit more about the amazing Genesis Framework and its awesome child themes. Because of the amazingly talented (and generous) Genesis theme creators whose themes we have featured here above. You have now hopefully found a free theme that you have downloaded and you are ready to use. StudioPress has also just released their all-in-one website builder called StudioPress Sites. Which theme (or themes) did you like the best? Let us know in the comments below. Also if there are other free Genesis child themes out there that you think we should add to the list, then let us know.